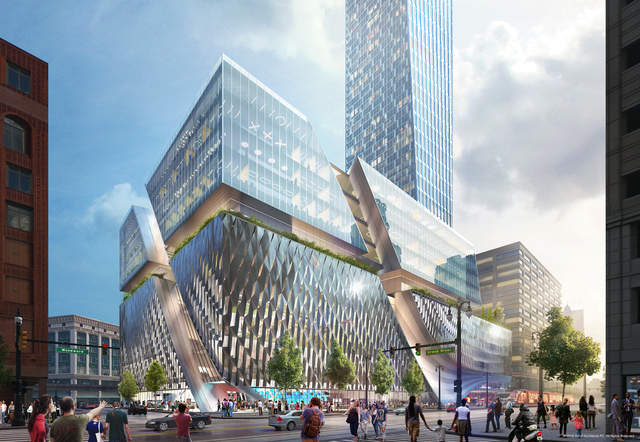 Rendering of Dan Gilbert’s project to build Michigan’s largest tower in downtown Detroit. Billionaire Dan Gilbert, who is set to receive tens of millions of dollars in tax incentives so he can build Michigan’s tallest building at the Hudson’s site in downtown Detroit, has refused to designate 20% of the 250 housing units as “affordable” as required by new city mandates. But lucky for him, Mayor Duggan and City Council bailed out yet another billionaire this week by allowing Gilbert’s real estate company, Bedrock, to provide just five affordable housing units inside the 52-story tower. To make up for the loss, Gilbert is now allowed to pick and choose where he’ll provide the “affordable” units across about five of his planned housing projects, as long as the total in his portfolio is at least 20%. But the new rules for Gilbert mean he can concentrate “affordable” housing in a few of his less ambitious projects, one of which is not even in downtown and another that involves micro-apartments that average just 260 square feet. Bedrock, for example, plans to provide 85 “affordable” micro-apartments out of 218 units at 28 Grand, a 13-story development in Capitol Park. Another plan calls for designating 60 of 300 units as “affordable” housing in Brush Park. Councilwoman Mary Sheffield, who originally proposed the affordability ordinance, was the only board member to reject the special arrangement, questioning Bedrock’s insistence that it can’t afford to offer 20% of its units to people who make below the average income in metro Detroit. Gilbert isn’t the only billionaire to receive special treatment from the city of Detroit. The Ilitch family, which was given an unprecedented $285 million in captured taxes to build a new hockey arena and adjacent developments, also was given a pass by Duggan’s administration to pick and choose which of the developments offer “affordable” housing. The affordability mandate applies to developers who receive tax incentives and is intended to create more diversity in and near downtown, where gentrification is displacing long-time residents. Steve Ogden, Bedrock’s director of real estate development, told City Council that the company can’t afford to build a new skyscraper if it’s required to provide 20% of the units to lower-income residents. “High rises are very expensive to build,” Ogden told the council. James Arthur Jemison, the mayor’s chief of Housing and Revitalization, agreed. Duggan and City Council have gone out of their way over the past three years to help billionaires in the downtown area as poverty increases in the neighborhoods. Earlier this year, the mayor and council approved several tax incentives, including $34.5 million in cash, to billionaire Tom Gores to move the Pistons to the publicly financed Red Wings arena. By the time the money and interest are paid off, the payout will cost taxpayers more than $70 million.